Crossovers seem to be moving further away from their SUV roots these days as many become increasingly carlike, and some go as far as not even offering all-wheel drive. The latest Ford Escape is a model that's a lot more like a car to drive than any truck-based SUV, but it's still capable of handling a bit of the rough stuff too if you choose to specify it that way. So, let's look at the 2018 Ford Escape in a little more detail to see what else it has to offer. Apart from its tall stance, it's hard to see too much of the Escape's truck-derived past in the way the current model looks. The 2018 version bears some resemblance to models like the current Focus, although despite that tall stance the Escape is still very different to something like the C-Max. The exterior styling recently benefitted from a modest refresh to keep it looking right up to date, although the sheet metal of the Ford is now effectively six model years old. Quite a few crossovers, especially ones of these compact proportions, are definitely going for a sporty look these days. It has to be said though, that it's hard to think of many that are anywhere near as sporty as this 2018 Escape. Buyers are presented with three different engine options for the Escape right now, with the engine in base models being a naturally aspirated 2.5-litre inline-four that produces 168 horsepower and 170 lb.-ft. of torque. The 1.5-litre EcoBoost turbo-four that was introduced last year remains as the middle of the trio with its 179 horsepower and 177 lb.-ft., but the 2.0-litre version of the EcoBoost is still the Escape's party piece with its entertaining 245 horsepower that makes the Ford go as well as it looks. All versions of the Ford feature a standard six-speedautomatic transmission, but shift paddles are added when the turbocharged engines are chosen. Most Escape models you're likely to come across on lots will probably be front-wheel drive, but all-wheel drive is also available. Crossovers like the Escape can probably always be made more fuel-efficient than they are, but too much compromise on performance in pursuit of fuel efficiency is unlikely to be tolerated by consumers. That's why Ford has gone for a superb balance between efficiency and performance here. The best fuel economy figures come from models equipped with the 1.5-litre EcoBoost and front-wheel drive, which come in at an estimated 10.2 L/100 km in the city and 7.8 L/100 km on the highway. However, even the Escape Titanium with the powerful 2.0-litre gets ratings as good as 11.5 L/100 km in the city and 8.8 L/100 km on the highway, which is pretty impressive for that level of performance. The Escape is now available in four trim levels, which start with the base S and then progress upwards to the SE, SEL and finally the top of the range Titanium model. All versions are pretty well-equipped as standard, with even entry models featuring: power features, a rearview camera, cloth seats, air conditioning, cruise control, 17-inch alloy wheels, a six-speaker AM/FM/CD sound system, and Sync infotainment with a 4.2-inch center screen. The SE gets the 1.5-litre engine as part of its standard equipment, but it builds further on the base trim with the likes of satellite radio, a power driver seat, dual-zone automatic climate control, keypad entry, and heated front seats. For some buyers, the SEL might look and feel like a top trim level thanks to its leather seats, power tailgate, 8.0-inch infotainment touchscreen and rear parking sensors. However, when you then see the exceptional list of goodies that come with the Titanium trim you soon realize the SEL isn’t as good as it gets by any means. 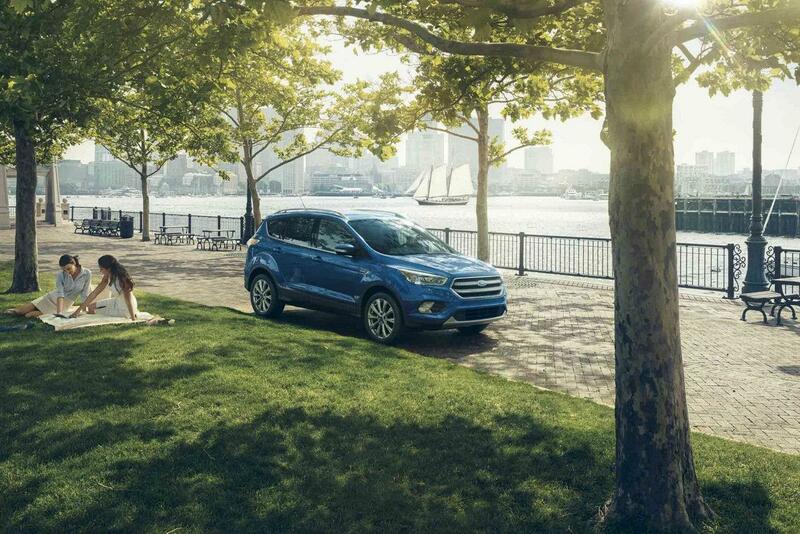 The 2018 Ford Escape is available now, so don’t hesitate to get in touch with us here at Van Isle Ford Sales Ltd for more information and to arrange a test drive in this sensational compact crossover.